I really love Instagram (and all the fun apps that go with it)! It's the first place I go to share my crochet makings and I've met so many great fellow crocheters there. 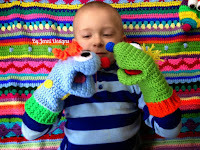 Recently, I shared a quick little pattern via. Instagram for my Colorado C Applique and I just wanted to take a minute to share it here on my blog also. 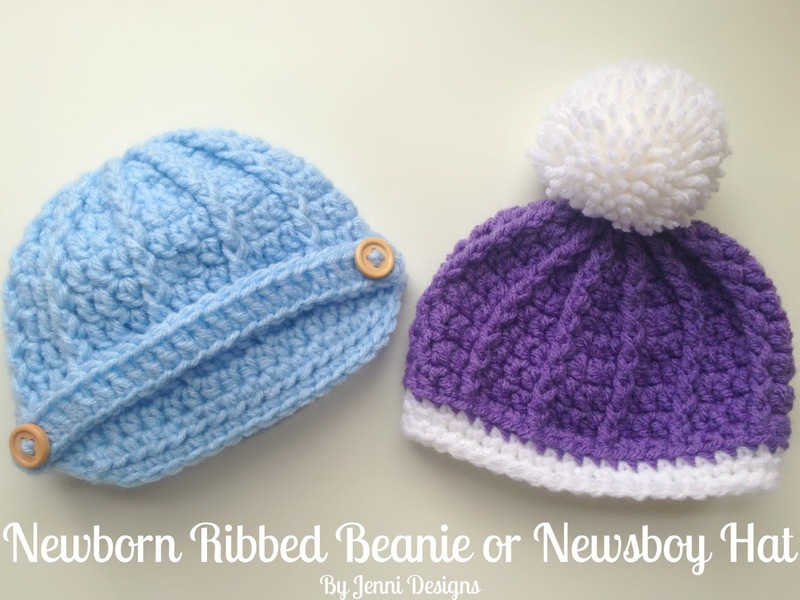 The blue hat was made using my Women's Ribbed Hat Pattern. Do you use Instagram? 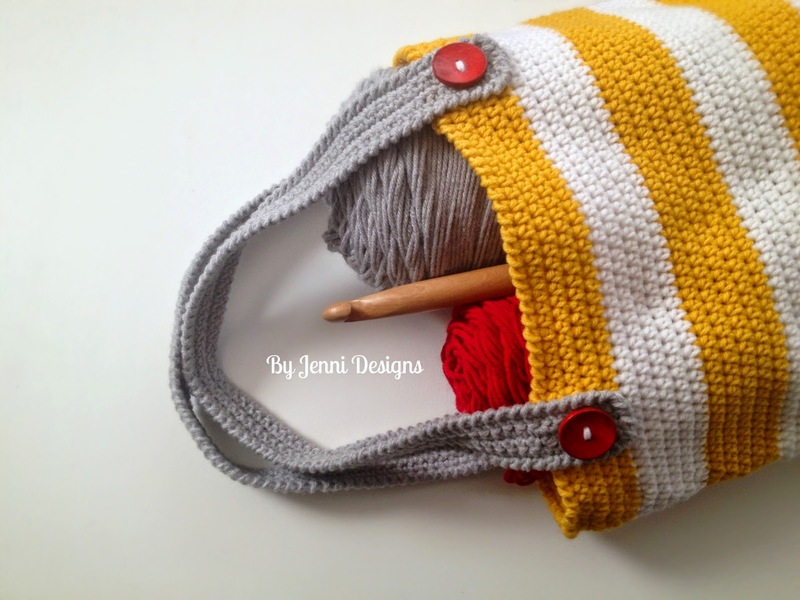 You can find me @byjennidesigns, I'd love to connect with you! 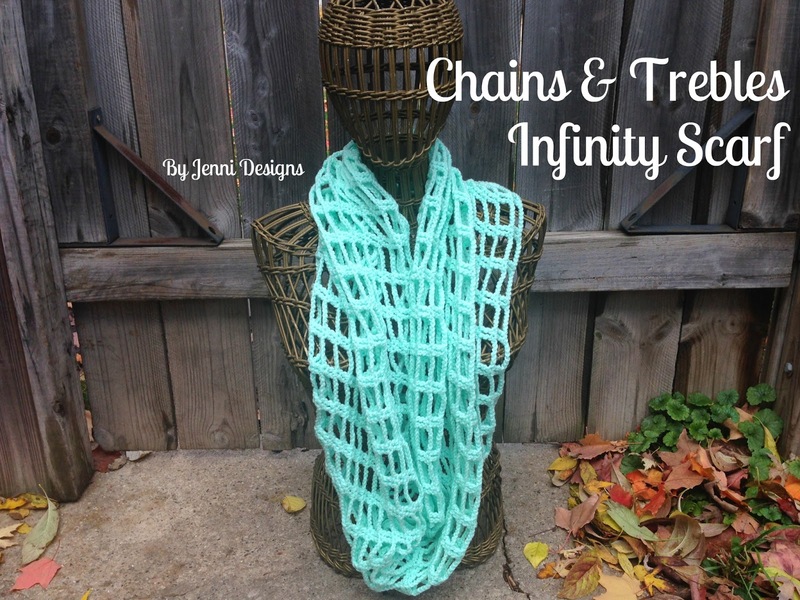 This is a great light weight scarf that I've been making for a couple years. The pattern is super simple and only uses 3 stitches: Chains, Trebles & Slip Stitches. 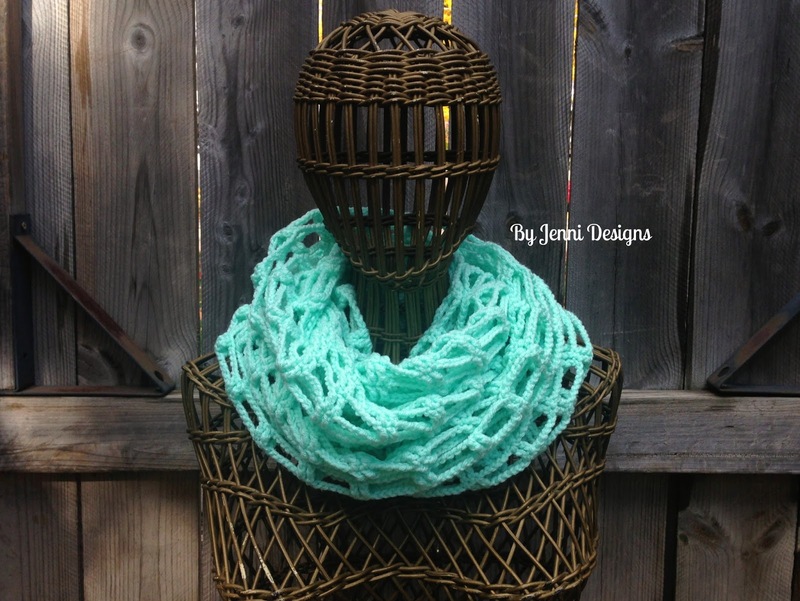 You can choose to wear the scarf long or double it up to keep extra warm! Thanks so much for stopping by, if you have any questions please don't hesitate to ask! Red Heart With Love Yarn, approx. 300 yds. A chain of 6 should measure approx. 1.5 inches. 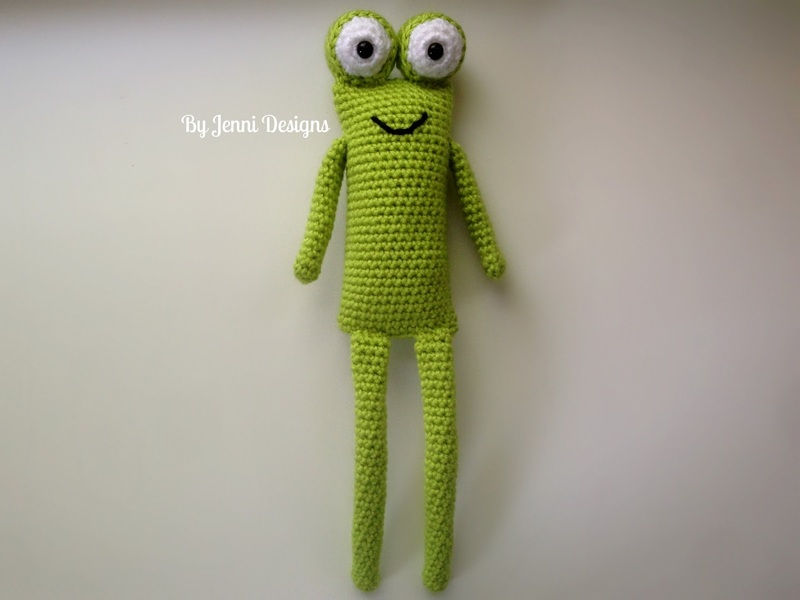 Recently, I've found that I enjoy crocheting toys or amigurumi very much! I wanted to try my hand at a simple frog pattern and here's the final result! 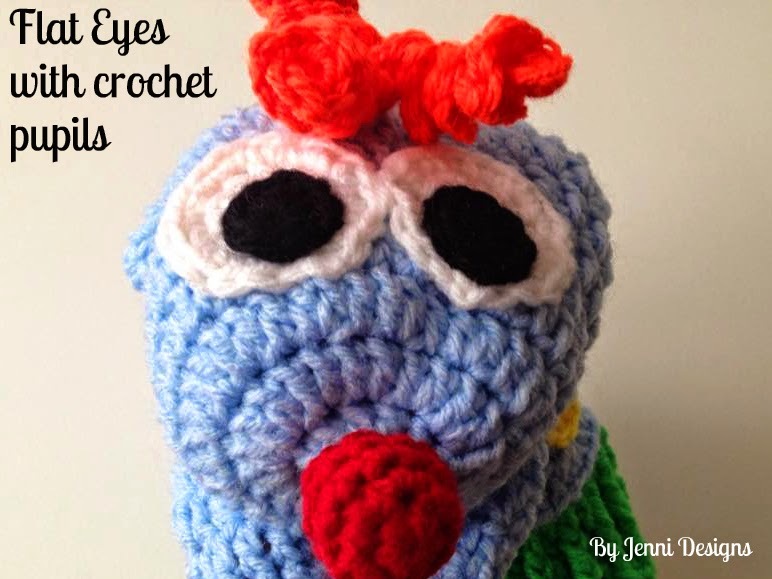 The pieces are simple to crochet, very easy to put together and works up fairly quick. I suggest using the same brand yarn for the entire project, whatever your favorite is. Below is the first frog I made, my youngest son just loved him! When he first saw him he laughed and said, "I really, really like him.....he's so silly...and cute...and funny! ..." He went on about him for a while. As you can see, he has shorter arms than the final frog above. You can choose to stop where you please for the arms but the pattern is written for the longer arms. While I was snapping the photo above my little guy waited patiently beside me then stuck his head in there too. 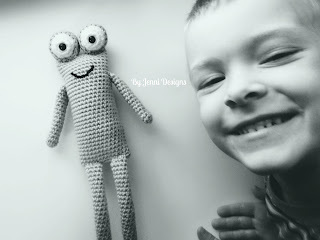 I adore this picture and I'm so glad he still loves Mom's crochet! The legs and arms of the frog are worked in the round after the 2nd row. You can easily make the legs/arms longer or shorter if you would like. After row 2 you should sew in your beginning end. Row 3: Sc in first and in each around. Instead of joining to the first sc, sc into it and you are now working in the round. For the legs: Continue to repeat row 3 until you reach 32 rows. For the arms: Continue to repeat row 3 for 25 rows. Work a sl st in the last space of your last row, then fasten off. When you are finished making both arms and legs continue on and make the body. The body of the frog is joined at the end of each row but you could also work the body in the round if you like. To work the body in the round do not join at the end of row 3, instead sc directly into the next space and keep going around and around until you reach 32 rows. Fasten off after row 32 leaving a long end to sew this opening shut. 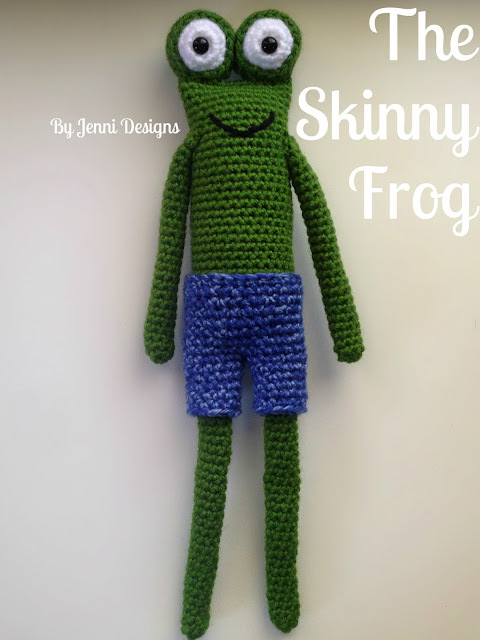 You can now sew the legs & arms onto the body. The legs should be sewn to row 1, leaving a small space between the legs and the arms should be sewn to about row 24. Next embroider on a smile using a tapestry needle and black yarn. You can now stuff with poly-fil and sew the opening shut. Continue on below with the eyes. Now would be the best time to place a safety eye in the center of the beginning magic circle. After placed, sew in this end. You should now stuff your eye with poly-fil. Fasten off, sew hole shut and sew in end. Fasten off and sew lid onto eye to make sure it's secure. Sew in end. 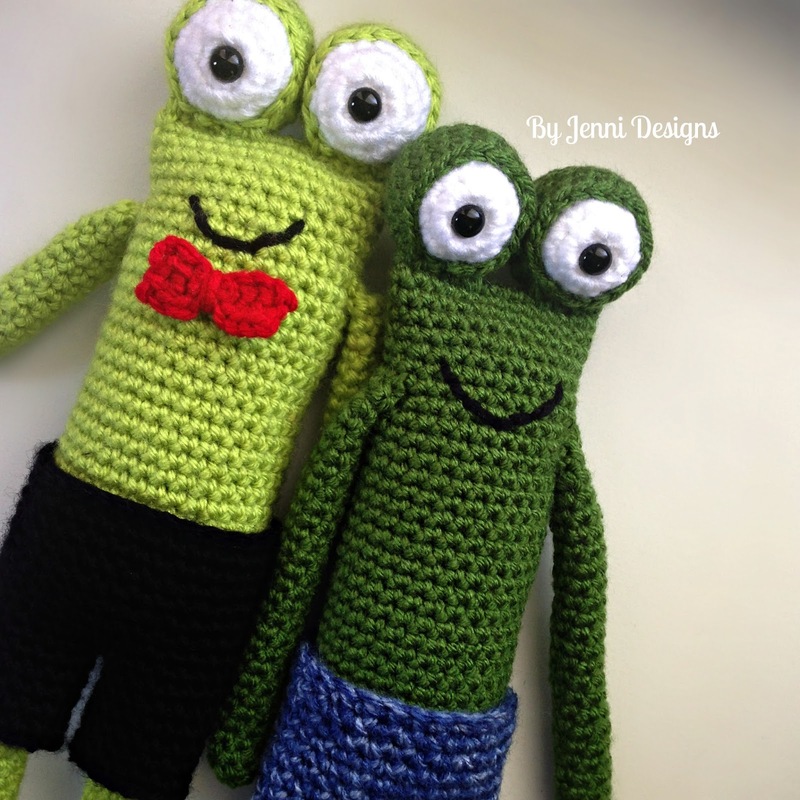 The last step in completing your frog is to sew his eyes on, make sure you also sew the two eyes to one another. Fasten off after row 14. You now have one side of the shorts completed. 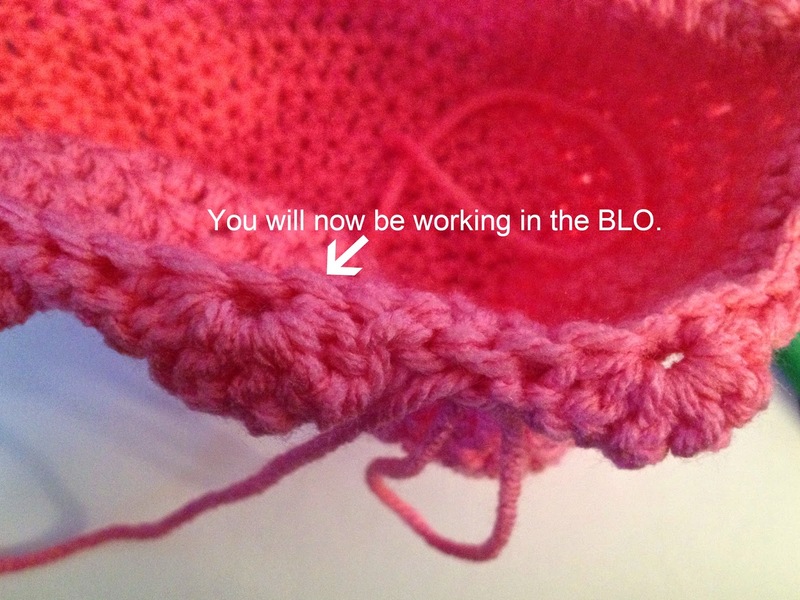 Next, join yarn with a sl st to the sp previously indicated to place a stitch marker in. You may now remove the stitch marker. Fasten off after row 6 and sew in your ends. Row 3: Sc in each across. 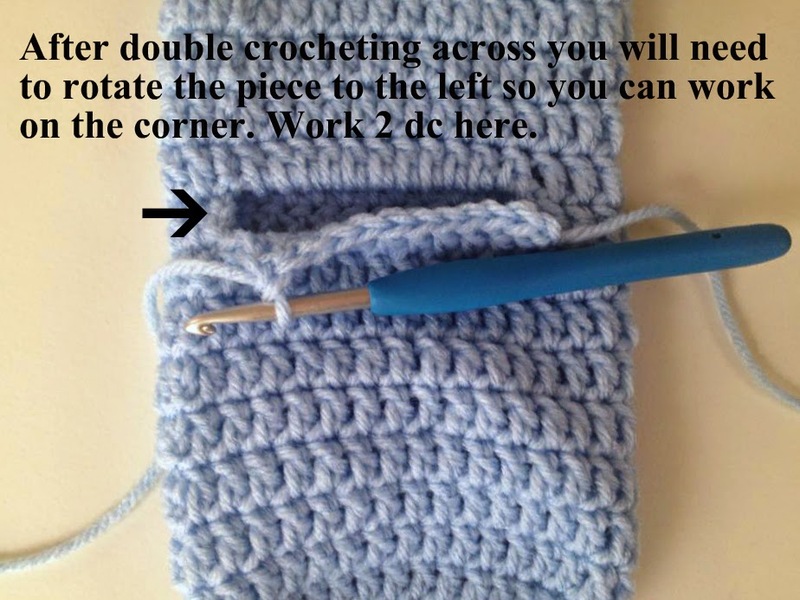 Using a separate piece of yarn, no longer than 12", tie a knot around the center of the piece you just made. Wrap one end around a couple times, knot the two ends together then use them to also secure the bow to the top of the frog. 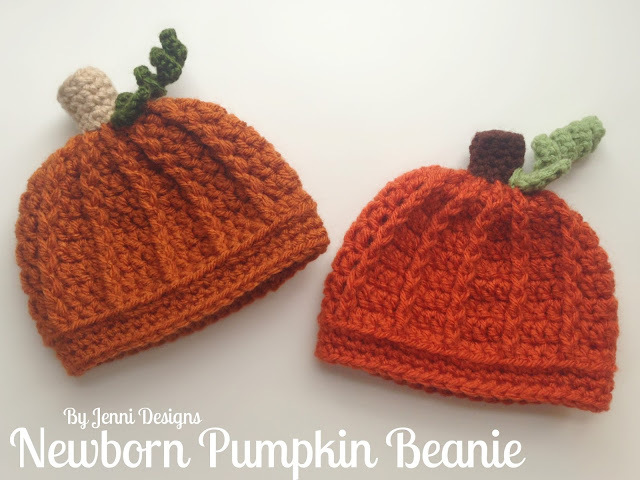 While creating the Ribbed Beanie or Newsboy Hat I realized the same hat could easily be used to make a cute little pumpkin hat and since Fall is nearly here why not share right away! I've re-written the pattern below for the hat so you don't have to pop over to the other pattern for it and added the easy patterns for the stem, leaf & curly vine. 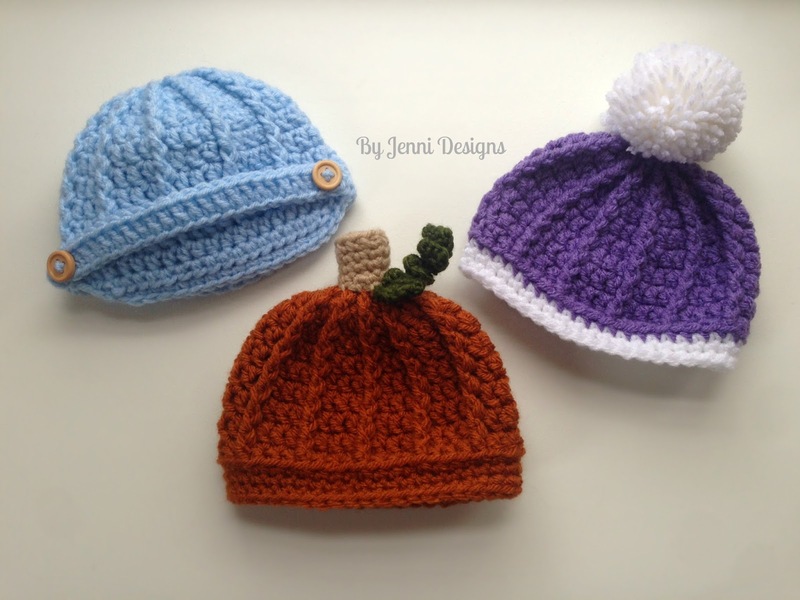 These are very simple additions and the entire hat can be completed within an hour. 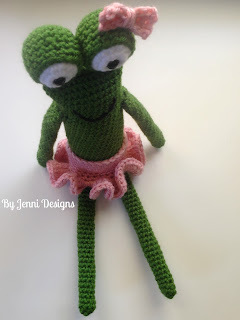 Please feel free to share pictures of your finished projects, you can add the photos to a project on Ravelry or upload them to my Facebook page here: facebook.com/byjennidesigns I love to see your finished work! Thanks for stopping by, Happy Fall! -Ch 2's count as a dc in rows 2-10 only. -Gauge: 3 dc's x 2 1/2 rows = 1". Fasten off after row 13 and sew in your ends. Fasten off, sew in beginning end & lightly stuff. Sew on to top of hat with remaining end. Row 1: Ch 6, sl st in 2nd ch from hook. Sc in next, Hdc in 2, sc in last. Ch 1 and sc in same while rotating piece to the right so you can work on opposite side of foundation chain. Hdc in 2, sc in next, sl st in last. Fasten off, sew on to hat. 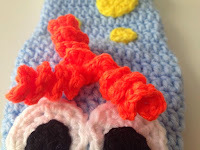 Row 1: Join yarn with a sl st to the base of the stem that you have already sewn on to the hat. Ch 15. Work 3 sc into 2nd ch from hook and in each across. Join with a sl st to the hat (or you can fasten off then sew this end on to the hat instead), fasten off and sew in all ends. 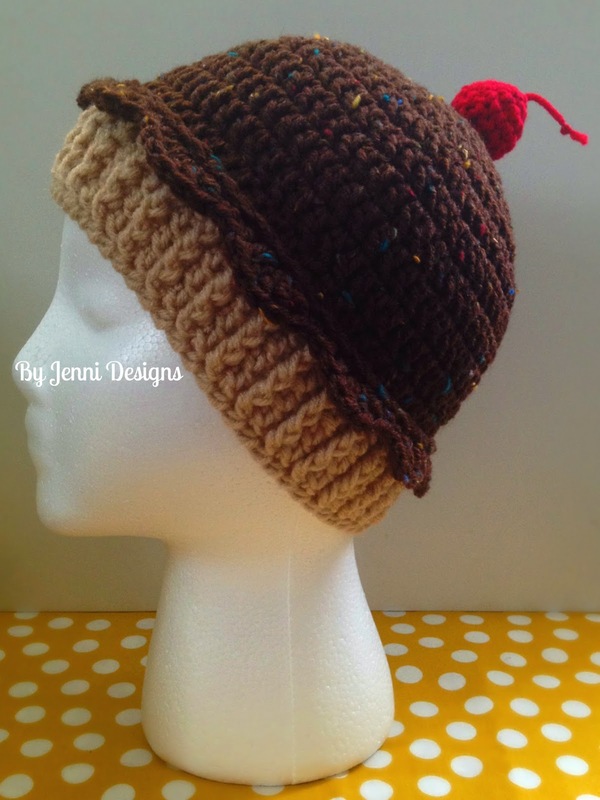 This sweet little hat was inspired by my Women's Ribbed Hat Pattern and works up quite fast. This is a simple pattern that you can easily change up for a slightly different look, I've included a 2 examples of my own below. If you have any questions feel free to ask so I can be of help. Fasten off after row 13 and sew in your ends, add an optional button to the band or whip up a little flower or applique and sew it on to the hat band. 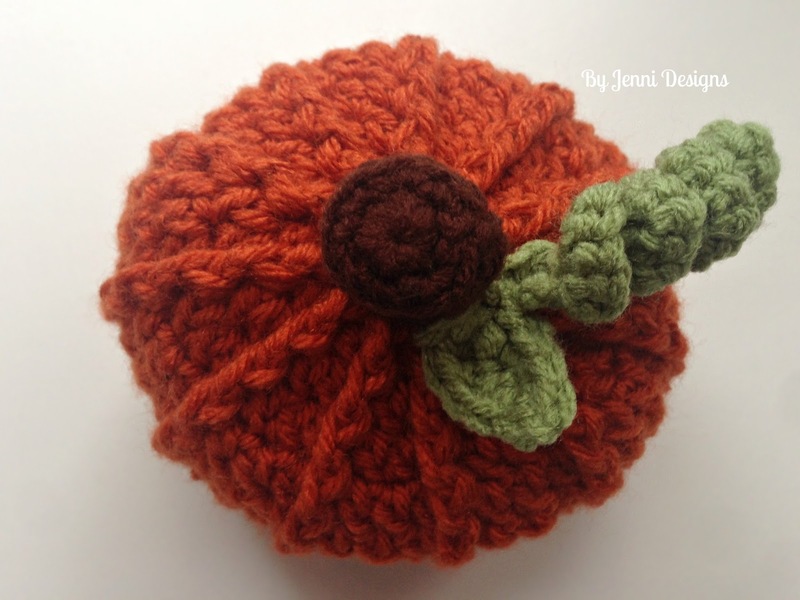 You may also want to add a pom-pom to the top of the hat, there are many ways you can make this simple hat your own. Row 12: Ch 1, sc in same, hdc in next 16, sc in next. Ch 1, turn. Row 13: Sk 1st, 2 hdc in next. Hdc in 13, 2 hdc in next, sl st in next. Ch 1, turn. Row 14: Sk 1st, sc in next and in each around. Join, fasten off and sew in ends. Row 1: Ch 27, dc in 3rd ch from hook, dc in next 23, sl st in last. Fasten off, sew on to hat and add 2 small decorative buttons. Sew in all your ends. For this pattern I played around with different hook sizes and found that simply changing the hook size (but using the same pattern) works perfectly for changing the size of the hat. Listed below is the gauge for each size, please check your gauge as I crochet tightly and you may need to adjust your hook to get the correct gauge. 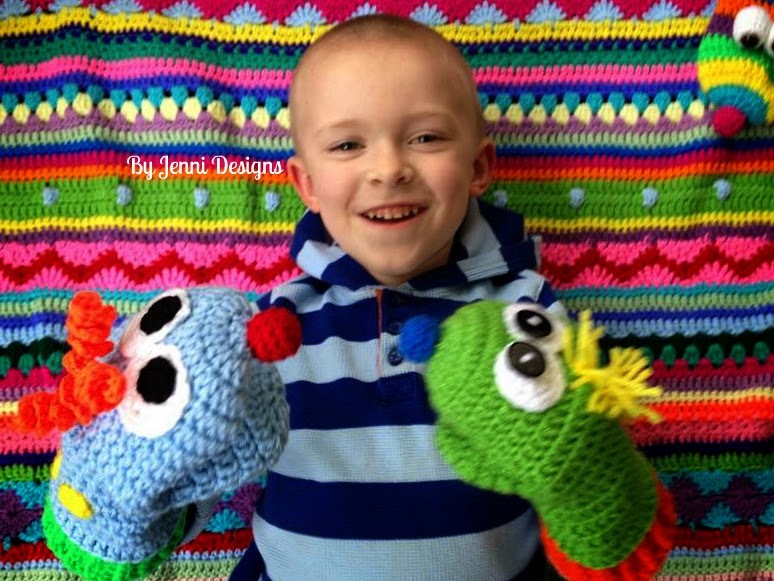 Thanks so much for stopping by to check out this pattern! -Joins should be made to the first dc, not the ch 2. -Ch 2's do not count as a dc. Size H Hook: 4 dc = 1"
Size I Hook: 3.5 dc = 1"
Size J Hook: 3 dc = 1"
If using size H Hook: 5.5"
If using size I Hook: 6"
If using size J Hook: 6.5"
For the next two rows, there is no need to check your stitch count, the rows may not end perfectly but this is ok.
Row 16: In FLO: Ch 2, 3 dc in same, 2 dc in next,*3 dc in next, 2 dc in next. * Repeat from *to* around. Join. Row 17: Ch 2, 2 hdc in same, sc in next, sl st in next, sc in next, 2 hdc in next, 3 dc in each of the next 6. *2 hdc in next, sc in next, sl st in next, sc in next, 2 hdc in next, 3 dc in each of the next 6. * Repeat from *to* around. Fasten off and sew in all ends. For these additions, be sure you are using the same size hook as the hat you made. Add as many tomatoes as you like and space them how you wish, I used 3 tomatoes in my example and spaced them roughly 10-15 stitches apart. Row 2: Turn, work 5 sc over the ch 4. Sc in top of tr, work 4 sc over the ch 3, sc in top of tr, work 5 sc over the last ch 4. Fasten off and knot these two ends together. Now sew in your ends under the row of sc's back & forth to help stiffen this edge of the tomato. This will help your tomato keep it's shape. In my example I used three different size onions, below I'll list each and you can decide which you would like to use. You may place your onions anywhere you please, I placed mine a couple stitches under each tomato so they would look layered. Large Onion: Using white, join with sl st to any hdc post from row 15. Ch 20, sk 7 posts, sl st to next post. Turn and work 25 sc over your ch. Turn and sl st across each sc. Fasten off. Using the ends, sew the onion edge to the hat and then sew the ends under the row of sc's like you did for the tomato. Medium Onion: Using white, join with sl st to any hdc post from row 15. Ch 15, sk 5 posts, sl st to next post. Turn and work 20 sc over your ch. Turn and sl st across each sc. Fasten off. Using the ends, sew the onion edge to the hat and then sew the ends under the row of sc's like you did for the tomato. Small Onion: Using white, join with sl st to any hdc post from row 15. Ch 10, sk 4 posts, sl st to next post. Turn and work 15 sc over your ch. Turn and sl st across each sc. Fasten off. Using the ends, sew the onion edge to the hat and then sew the ends under the row of sc's like you did for the tomato. 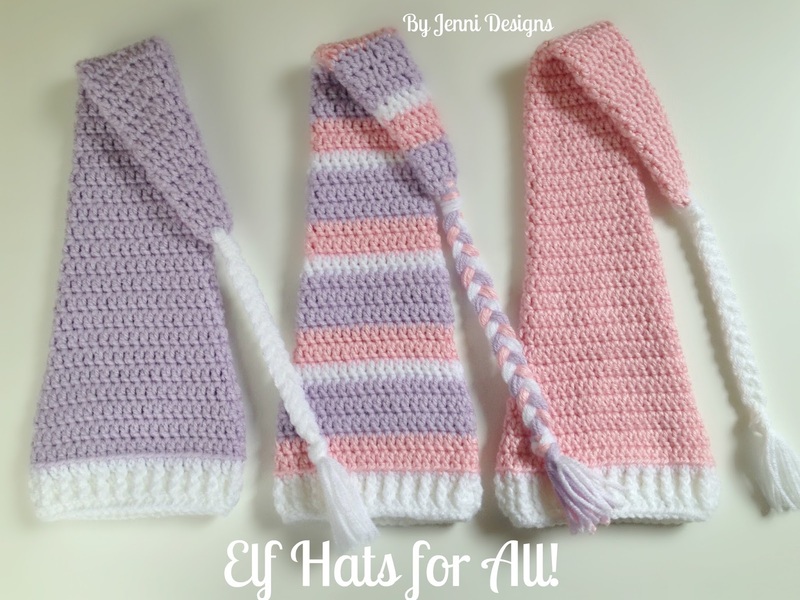 Free Crochet Pattern: Elf Hat's for all! This pattern is super simple and the best part is you can easily continue increasing to obtain any size elf hat you wish! 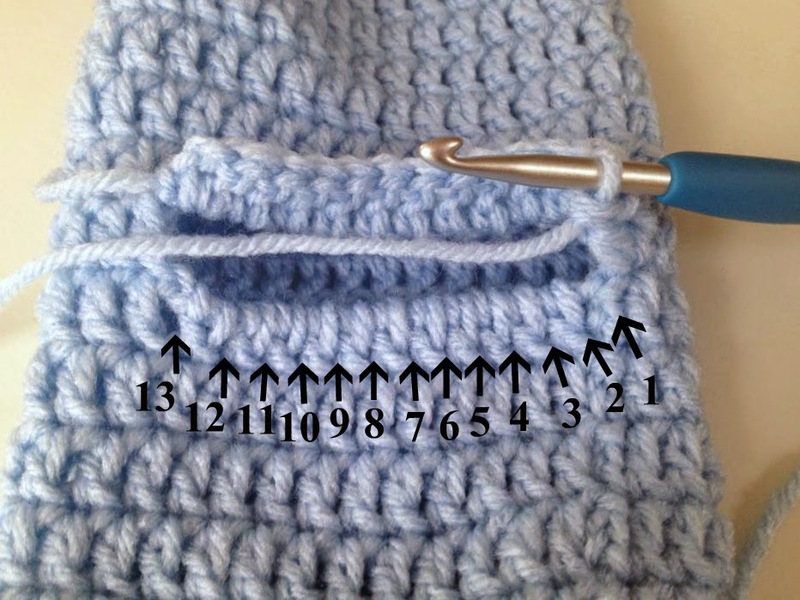 The written pattern is for the 0-3 month size but the size changes are noted after row 29. The 0-3 mo. 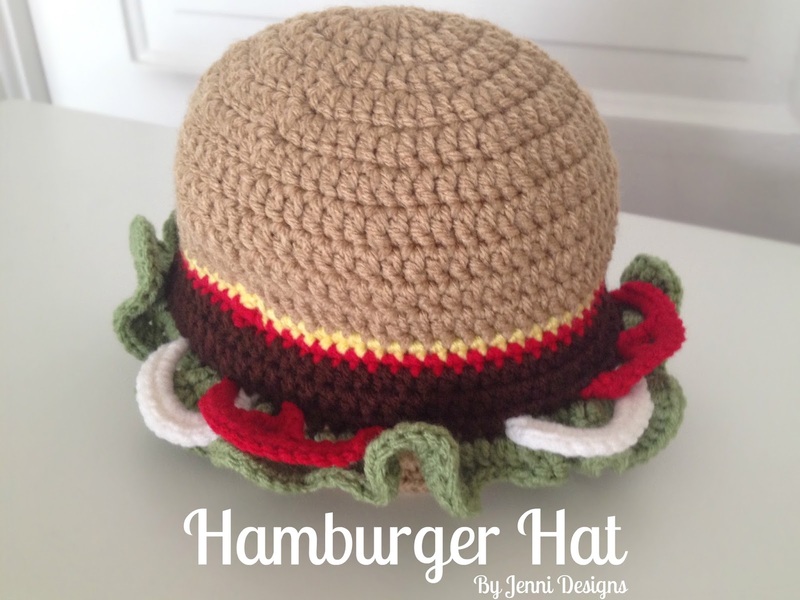 size hat will fit a head circumference of 14-15". Please remember all head sizes can vary age to age and my sizes are listed as a guide only. I suggest taking your own measurements before starting. I have not listed which rows to change colors in, your color changes are up to you or make your hat a solid color with the band and pom pom a contrasting color. -Ch 1's do not count as a stitch. -All joins are made with a sl st to the first dc in the row. -Be sure you are working this hat right side out, it is very difficult to turn it right side out at the end. Also, if you are working stripes be sure to sew in your ends as you go. 4 dc & 2 rows = 1"
Gauge is important to obtain the correct size hat, if you are not getting gauge please adjust your hook size. 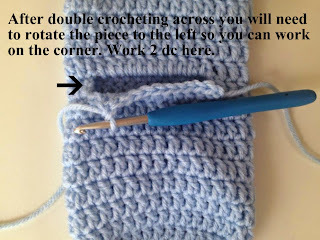 For rows 2-29 each row will increase by 1 stitch, 2 dc's are worked in the very last space of each row. When you reach row 29 your stitch count should be 36 (for the 0-3 mo. size elf hat). Row 2-29: Ch 1, dc in same and in each around, work 2 dc total in last sp. Join. To make this hat for a newborn continue on to row 30. For all other sizes follow the recommendations below. Repeat the last row (labeled row 2-29) for 4 additional rows, your last row should have a stitch count of 40 dc. Now continue on below with the row labeled 30, please note the stitch count will no longer be correct but your final increase row (labeled row 33) should have a stitch count of 48 dc. Repeat the last row (labeled row 2-29) for 8 additional rows, your last row should have a stitch count of 44 dc. Now continue on below with the row labeled 30, please note the stitch count will no longer be correct but your final increase row (labeled row 33) should have a stitch count of 52 dc. Repeat the last row (labeled row 2-29) for 12 additional rows, your last row should have a stitch count of 48 dc. Now continue on below with the row labeled 30, please note the stitch count will no longer be correct but your final increase row (labeled row 33) should have a stitch count of 56 dc. Repeat the last row (labeled row 2-29) for 16 additional rows, your last row should have a stitch count of 52 dc. Now continue on below with the row labeled 30, please note the stitch count will no longer be correct but your final increase row (labeled row 33) should have a stitch count of 60 dc. Repeat the last row (labeled row 2-29) for 20 additional rows, your last row should have a stitch count of 56 dc. Now continue on below with the row labeled 30, please note the stitch count will no longer be correct but your final increase row (labeled row 33) should have a stitch count of 64 dc. Repeat the last row (labeled row 2-29) for 24 additional rows, your last row should have a stitch count of 60 dc. Now continue on below with the row labeled 30, please note the stitch count will no longer be correct but your final increase row (labeled row 33) should have a stitch count of 68 dc. Repeat the last row (labeled row 2-29) for 28 additional rows, your last row should have a stitch count of 64 dc. Now continue on below with the row labeled 30, please note the stitch count will no longer be correct but your final increase row (labeled row 33) should have a stitch count of 72 dc. Repeat the last row (labeled row 2-29) for 32 additional rows, your last row should have a stitch count of 68 dc. Now continue on below with the row labeled 30, please note the stitch count will no longer be correct but your final increase row (labeled row 33) should have a stitch count of 76 dc. If you are making a size larger than the 6-9 mo. size you may want to repeat the last row one or two more times, this is completely up to you though. After sewing in all your ends you can now add a pom-pom or braid! I am so excited to share this pattern! 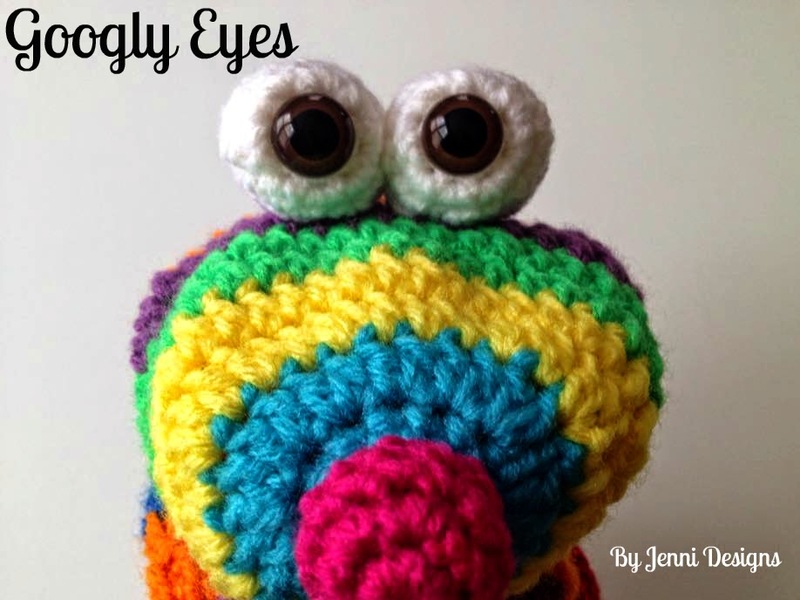 It's 100% inspired by my youngest son who recently approached me with a sock on his hand asking how we can make it have eyes. 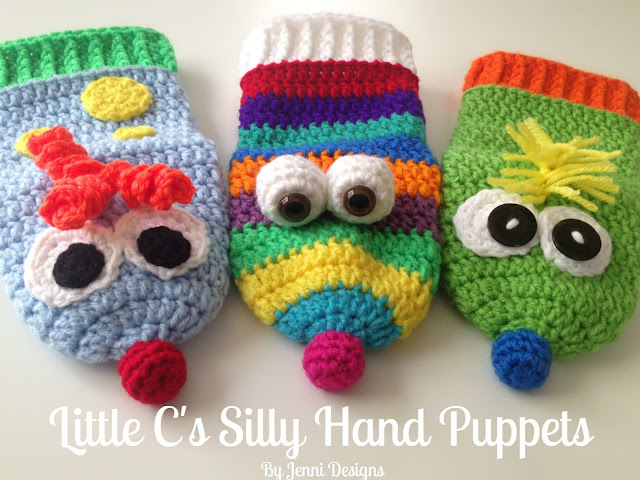 From there these fun puppets were born! These would be a great way to use up scrap yarn and you can customize them in many ways. 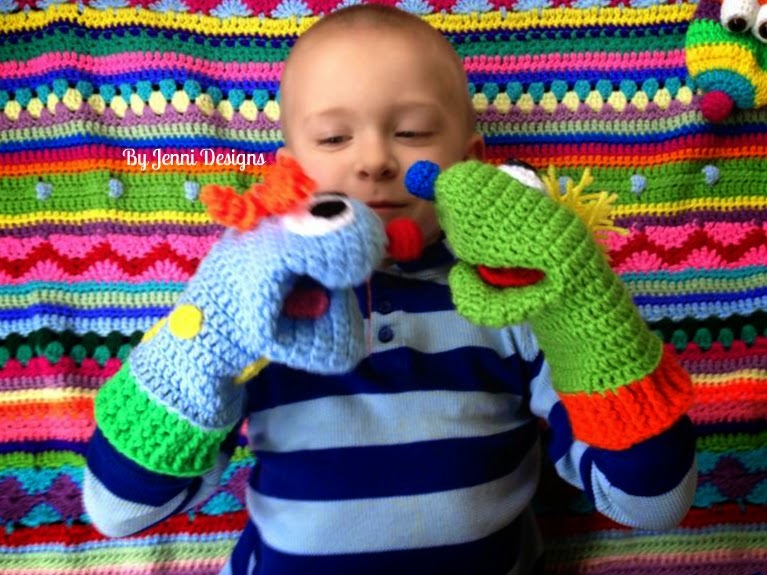 If you give the pattern a try, we'd love to see how your puppets turn out! Feel free to share on Google+, Instagram (using either @byjennidesigns or #byjennidesigns), upload to Ravelry as a project or share on my Facebook wall. If you have any questions please do ask, thanks so much for stopping by! 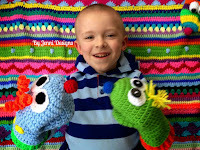 Here's my Little C with his puppets! Size: Youth-Women's, as a guide my hand measures from the top of the middle finger to the bottom of my hand measures about 7" and my son's measures 5". Slst2tog - Insert hook in first sp, pull up a loop (2 loops on hook), insert hook into next sp, pull up a loop and pull loop through both loops on hook. Stitch complete. -Ch 2's do not count as a dc unless otherwise stated. -Joins are made with a sl st to the first stitch, not the beginning ch. -Be sure to always pull your beginning magic circles tight before sewing in the end. Fasten off & sew in ends. 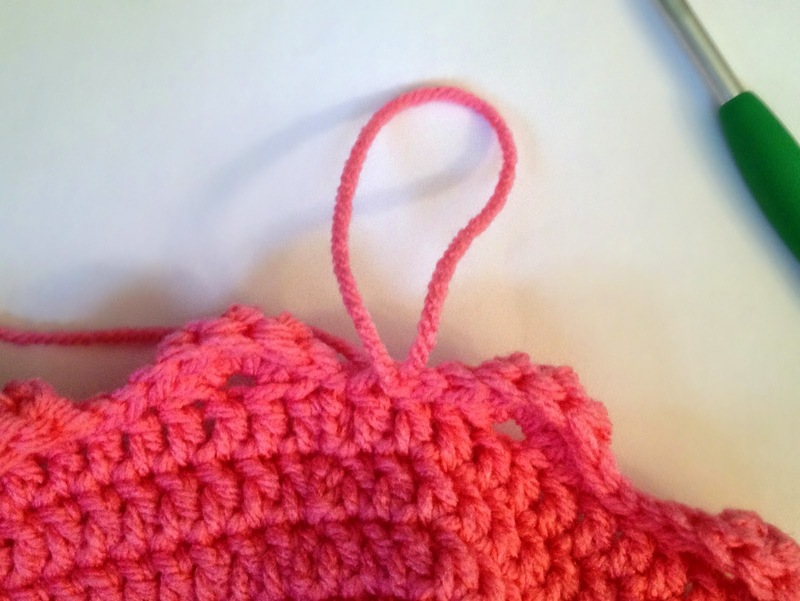 Attach yarn with a sl st in the dc you placed a stitch marker in earlier and you can now remove the stitch marker. Row 1: Ch 2, dc in same and next 10. Rotate piece so you can work 2 dc over the dc post that is the corner of the opening. Now rotate your piece again and you will now need to work between the dc's. Fasten off leaving a long end. Turn piece inside out and sew shut the hole, also sew in any other ends at this time too. Fasten off leaving long end to sew on to puppet. Sew any spots you've made on to desired area on puppet now, sew in ends. 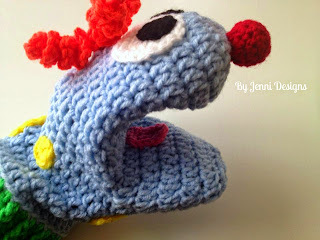 Stuff the nose now with poly fil or small bits of yarn. Fasten off. 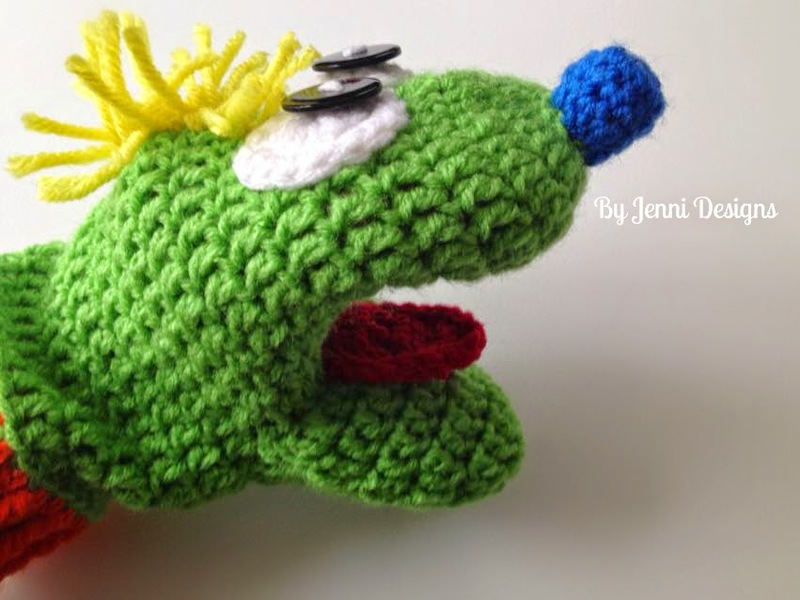 You will have a small hole, just sew it shut and then sew on to the puppet. Sew in ends. Fasten off leaving long end for sewing on to puppet. Fasten off leaving long end for sewing on to white part of eye. 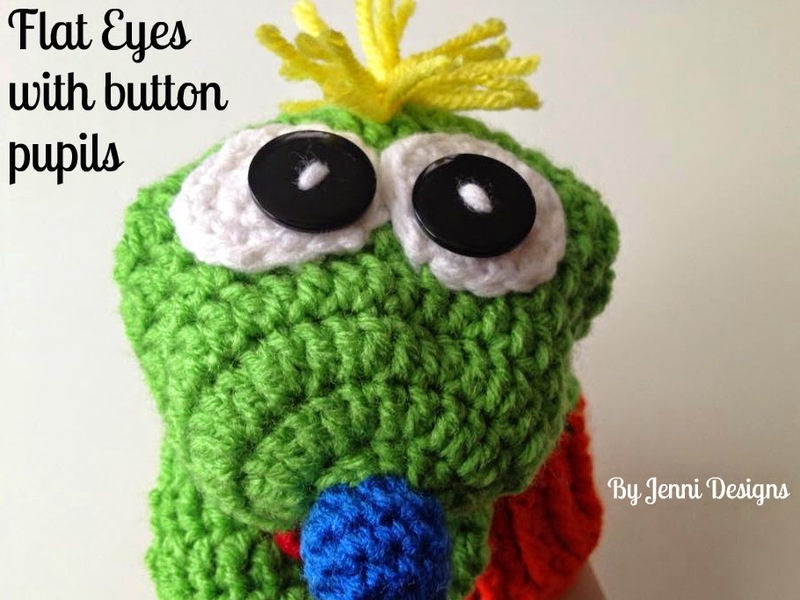 Sew eyes on to puppet and sew in ends. Important note: Insert your safety eyes before pulling your magic circle shut, I did this after row 2. Fasten off leaving long end for sewing on to puppet, after sewing on sew in ends. Leave a long end in the beginning for sewing on to the puppet. Row 6: Sc2tog. Sl st around the entire edge of tongue, fasten off leaving long end for sewing on to puppet. When sewing this tongue into the mouth you will need to sew down about half of it so it lays nicely. Row 5: Sl st, sc, sl st. Sl st around entire edge of tongue, fasten off leaving long end for sewing on to puppet. Cut strands of yarn and double knot on to the top of the head of the puppet or add longer strands and braid them together, add multiple colors or keep your puppet bald. You can also make cute curls (my favorite) by doing the following: Attach yarn with sl st where you would like the curl to start, chain as long as you would like (my chain is 15). Work 3 sc into the 2nd ch from hook and in each chain down except the last. When you get to the end of the chain sl st to the head and either start another curl (I made 3 curls) or fasten off. Sew in ends. This easy tote is worked in hdc's with a crab stitch edging, I love the crab stitch and use it often! 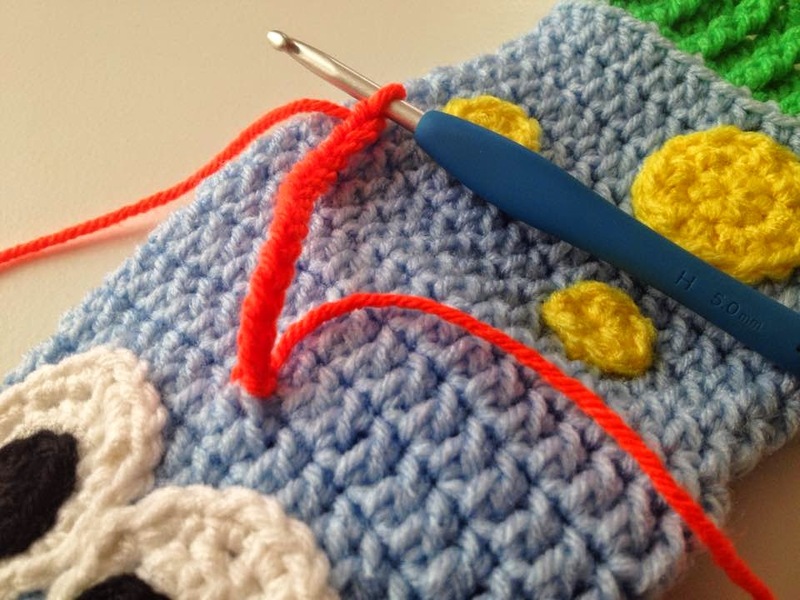 The crab stitch is also referred to as a reverse single crochet by some. I recommend Caron One Pound yarn for this project, this yarn is slightly stiff (but not scratchy) and works well for a bag. You may of course use any worsted weight yarn you would like. If you have any questions at all feel free to ask away, thanks for stopping by! -Joins are made with sl st, be sure to pull your sl st joins tight so you don't end up with holes or gaps in your work. 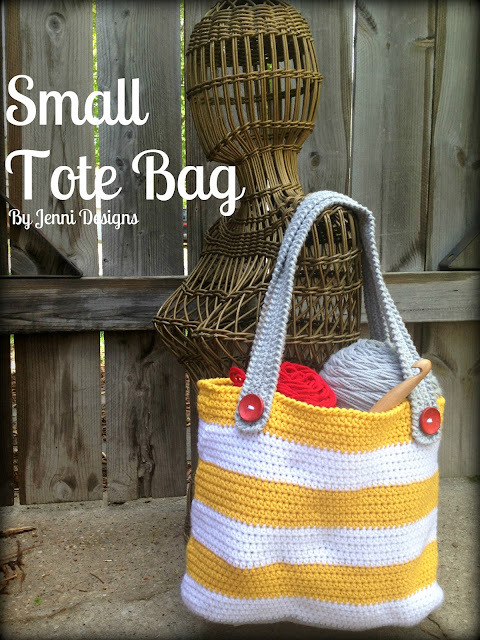 4 hdc & 3 rows = 1"
Gauge is not extremely important for this pattern unless you want your tote the same size as the example. Your piece should measure about 12" x 3 1/2". 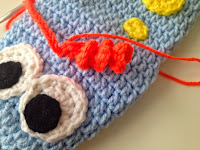 Row 35: Ch 1, Crab Stitch around, join, fasten off and sew in all your ends. Row 5: Crab stitch around entire strap, ch 1 at the corners. Join, fasten off and sew in ends. If you are adding the optional buttons, add them now and then sew your straps on to the bag. I laid the bag flat and measured from the sides about 2 1/4" for my placement. Now this next step is optional but I didn't like how my stitches looked on the inside of the bag from sewing on my straps so I decided to create a little patch to cover them with. If you are lining your bag with fabric this step is not necessary. Unfortunately, my sewing machine hasn't been in working condition so I am not lining my bag (I was considering hand sewing a lining, maybe later though.). Row 5: Hdc in same and in each across. Fasten off leaving a long end to sew on to bag. Using a whip stitch sew patch on to bag, sew in ends. -Gauge: 4 dc & 2 rows = 1"
Your circle should measure about 6" across the center. Row 12: IN FLO: *Sk 2, in next: [dc, 4 tr, dc], sk 1, sl st in 2. * Repeat *to* around. 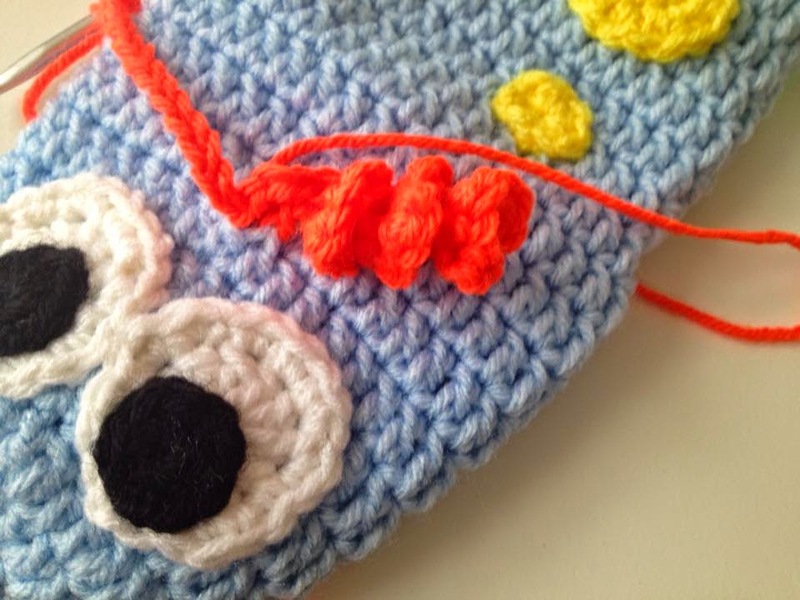 Do not fasten off, instead pull up a loop and leave the yarn attached. Remove your hook. We will come back to this after finishing the cupcake portion of the hat. -The next row is worked in the un-worked back loops from the previous row, hold down the shells while working around. 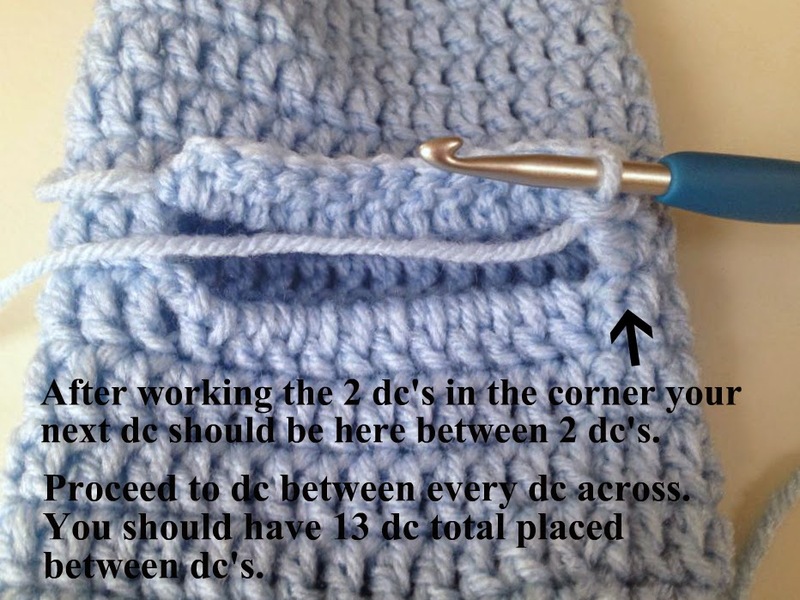 Be sure to count your stitches at the end of the next row and be sure you have 66 dc. Row 14-18: Ch 3 (counts as dc), fpdc around next. *Dc in next, fpdc around next* Repeat *to* around. Join to 3rd chain. -Work the next row loosely. Row 19: Ch 1, turn, sl st in next and in each around. Join, fasten off and sew in ends. Now using your frosting color again: Insert your hook into the loop you left loose earlier, *Sl st, ch 1* around the hat repeating from *to* just above the shells you created, this will help the shells to lay nicely. Fasten off and sew in ends. You should now fill your cherry with poly-fil or small ends of yarn work like a charm too! Row 7: Ch 1, sc2tog 4 times. Join. Fasten off leaving long enough end to sew onto top of hat. If needed, sew bottom of cherry closed. Sew on to hat and either sew in the end or pull it through the top of the cherry to make a stem. Tie a knot in the stem as close to the top of the cherry as possible so it will stay in place. Optional: You can now add sprinkles to the top of the hat by tying on yarn pieces in multiple colors or leave it as is. 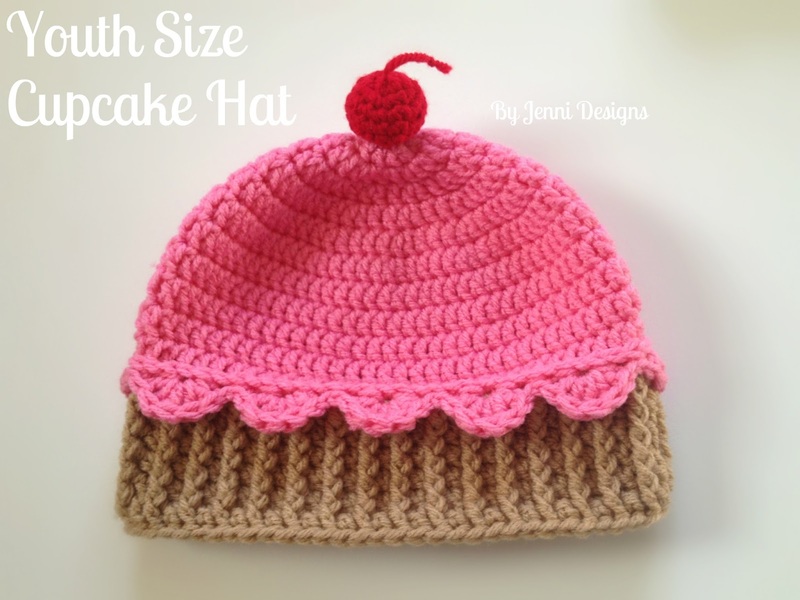 I've also created the same hat using Red Heart Super Saver Coffee Fleck, this fun yarn makes sprinkles easy!